Western intelligence experts are concerned over a new breed of jihadist terrorist being primed to carry out fresh attacks in their home countries. 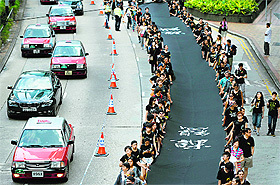 Thousands of pro-democracy activists clad in black marched silently through Hong Kong on Sunday, holding banners saying they felt betrayed and angry at Beijing's refusal to allow fully-democratic elections for the city's next chief executive in 2017. North Korea's Supreme Court today sentenced a 24-year-old American man to six years of hard labour for entering the country illegally and trying to commit espionage. 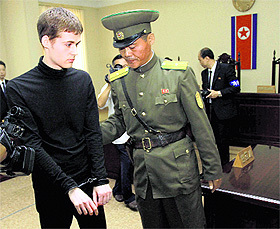 At a trial that lasted about 90 minutes, the court said Matthew Miller, of Bakersfield, California, tore up his tourist visa at Pyongyang's airport upon arrival on April 10 and admitted to having the "wild ambition" of experiencing prison life so that he could secretly investigate North Korea's human rights situation. In a major boost to the morale of anti-government protesters, a Pakistani court today ordered the release of all arrested supporters of Imran Khan and cleric Tahir-ul-Qadri, a day after the two leaders suspended talks and mounted pressure on the embattled government. Residents of Crimea, the Black Sea peninsula that Russia annexed from Ukraine in March, are voting for their regional parliament in elections expected to be dominated by Russian President Vladimir Putin's backers. With only a few days to go until Scotland decides whether it will remain part of the United Kingdom, questions are being asked about why leading politicians didn’t get involved in the debate earlier. The Obama Administration is leaving no stone unturned to woo Prime Minister Narendra Modi during his maiden visit to the US which is expected to take the strategic bilateral relationship to the next level and unleash the potential of economic and trade ties. President Pranab Mukherjee arrived here today on a four-day state visit to strategically important Vietnam during which he will hold talks with the country’s top leadership and the two nations will ink pacts in key areas of oil exploration and air connectivity. Only hours before the latest beheading of a Western hostage, authorities in the UK fear that children as young as 10, described as 'junior jihadis', and dozens of women are being indoctrinated by extremist online propaganda and radical preachers. London's Deputy Mayor for policing Stephen Greenhalgh is quoted as saying that Muslim primary school pupils are being subjected to extremist ideologies by their own families. He warns the "horrendous" threat will be ongoing for the long term, saying, "Not just a couple of years, but for the next generation." London's City Hall has hosted a counter terrorism summit to share methods used in cities across the UK to tackle violent extremism. His comments were timed to coincide with the counter-terrorism summit and following the arrest of several teenagers over alleged terror offences connected with the Iraq and Syria conflicts. They also came shortly before British aid worker David Haines was beheaded by Islamic State militants on the Syria/Iraq border. Greenhalgh said: "The Mayor and I have seen case studies which are quite shocking," he said. "Some of them are very young. We are talking about under the age of 10. It starts very young with them being subjected to propaganda, extremist ideology, and being trained to be junior jihadis. "It's pretty horrendous when you hear how some of these children are being radicalised. The threat of radicalisation of young people is real and this is a problem that is going to be with us not just for a couple of years, but for the next generation." Concern about the terrorist brainwashing of children is matched by worries about how women are also being recruited by extremists. They include the likes of Glasgow-born Aqsa Mahmood who has called on other female jihadists to participate in holy war. Western security experts believe she is among dozens of British women who have joined the ranks of Islamic terrorists in Syria. They believe her recruitment could be the prelude to a series of suicide bombings carried out by women in Western capitals, similar to the 2005 bombings carried out by women in Iraq. 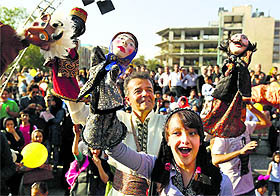 Those bombers included a 38-year-old Belgian woman, Muriel Degauque, who killed herself on November 9, 2005, after attacking an Iraqi police post in the town of Baqubah. In recent weeks, more British women jihadists have taken to the Internet to condemn politicians in London and literally call for their heads. They include 18-year-old Umm Khattab who said on Twitter: "Insha Allah (God willing) a day will come when (British Prime Minister) David Cameron's head will be on a spike as he continues to wage war on the awilya (protectors) of Allah... and strike terror in the hearts of the kuffar." Most of the would-be female jihadists, including Manchester-based twins Salma and Zahra Halane, are based in the Islamic State capital of Raqqa in Northern Syria. The Halane twins have been joined by their mother, Khadijah, and Sally Jones, a white British convert from Chatham in Kent who posted a picture of herself on Twitter dressed as a nun and holding a gun. She is alleged to have warned: "You Christians all need beheading with a blunt knife and stuck on the railings at Raqqa... Come here I'll do it for you." 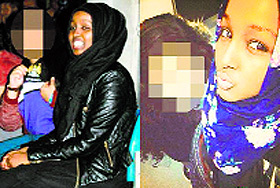 Commenting on the Halane twins' disappearance from their home in the UK, a spokesman for the UK's North West Counter terrorism Unit said, "They are clearly posing a threat to themselves and potentially the community and their family and friends are concerned for their well-being." They are believed to have been recruited to a female only militia, the Al Khansaa Brigade, based in Raqqa and headed by Aqsa, to implement female law enforcement. "Sweet, intelligent and peaceful" are some of the adjectives used to describe 20-year-old Aqsa, the daughter of Pakistani immigrants, who was raised in a prosperous Glasgow suburb from where she attended an expensive private school before enrolling for a radio therapy university degree. Last November she abandoned her university course, her local friends and her family before running off to the Syrian city of Aleppo where she met and married a leading jihadi fighter. In a series of terrifying messages she now exhorts would-be militants to follow the example of Boston Marathon bombers, Dzokhar and Tamerlan Tsarnaev and the brutal killers of British soldier Lee Rigby who was stabbed to death in broad daylight in London. "Follow the examples of your brothers from Woolwich, Texas and Boston", she has tweeted. "If you cannot make it to the battlefield, then bring the battlefield to yourself." Umm Khattab (18) from the UK said on Twitter: "Insha Allah (God willing) a day will come when (British Prime Minister) David Cameron's head will be on a spike as he continues to wage war on the awilya (protectors) of Allah... and strike terror in the hearts of the kuffar"
"Students should focus on studying!" shouted Pok Chun-chung, an organizer of the pro-establishment "Protect Hong Kong" movement. "If you adults have guts then you should occupy Central yourself, not use children as cannon fodder!" The protest remained peaceful and police stood by. Organisers estimated there were around 4,000 marchers at the height of the protest. Police estimated 1,860. North Korea's Supreme Court today sentenced a 24-year-old American man to six years of hard labour for entering the country illegally and trying to commit espionage. At a trial that lasted about 90 minutes, the court said Matthew Miller, of Bakersfield, California, tore up his tourist visa at Pyongyang's airport upon arrival on April 10 and admitted to having the "wild ambition" of experiencing prison life so that he could secretly investigate North Korea's human rights situation. Miller, who waived the right to a lawyer, was handcuffed and led from the courtroom after his sentencing. The court ruled that it would not hear any appeals to its decision. Earlier, it had been believed that Miller had sought asylum when he entered North Korea. During the trial, however, the prosecution argued that it was a ruse and that Miller also falsely claimed to have secret information about the US military in South Korea on his iPad and iPod. Miller is one of three Americans now being held in North Korea. A trial is expected soon for Jeffrey Fowle, who entered the North as a tourist but was arrested in May for leaving a Bible at a provincial club. The third American,Korean-American missionary Kenneth Bae, is serving out a 15-year sentence for alleged "hostile acts." The Pakistani police arrested several protesters and a court yesterday ordered that 100 opposition activists be sent to jail on a 14-day remand for holding illegal protests and for other violations. Out of the hundred, 91 workers belong to Khan's Pakistan Tehreek-e-Insaf (PTI) while the remaining are Pakistan Awami Tehreek (PAT) workers. A spokesman for Ukraine's national security council, Volodymyr Polyovyi, told reporters today that Ukraine considers the election illegal and that those responsible for holding them could be charged with seizing state power, which carries a prison sentence of up to 10 years. Over the last week, there has been a sudden boost to the pro-independence side with opinion polls putting the ‘yes’ (for independence) vote on top, or neck-and-neck for the first time. Parliament and travel to Scotland to personally make the case for the union staying together. In an emotional speech in Edinburgh, the Scottish capital, Cameron said he would be ‘heartbroken’ if the Scots opted for divorce. “I don’t want my children to grow up in a world where if they choose Edinburgh University, they are going to be in a foreign country,” he said. Meanwhile, even opponents of the leader of the Scottish National Party (SNP), Alex Salmond, agree that he has vitality and energy that many in Westminster lack. His passion for Scottish independence has almost singlehandedly caused a genuine fear among Britain’s political elite that Scotland could vote to leave. The leader of the ‘better together’ campaign, former Labour Chancellor of the Exchequer Alasdair Darling, though perfectly competent, is hardly a headline name. Arguably, the single most respected and potentially influential individual in the UK, the Queen, has refused to be drawn into the debate about independence. Her Majesty, royal advisers explain, is above politics and cannot be expected to publicly declare her views. However, the leader of the United Kingdom Independence Party (UKIP), Nigel Farage, and currently one of the most popular grassroots politicians in the country, has called on the monarch to come out in favour of keeping the union intact. “If the UK is threatened, it might be right for her (the Queen) to say something,” Farage said in a radio interview. 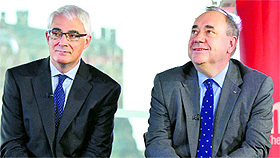 The independence referendum will take place on Thursday. The administration is gearing up to give a red carpet welcome to Modi when he arrives in Washington on September 29 from New York where he would attend the annual General Assembly session of the United Nations. The discussion between Modi and Obama over two days in Washington is expected to result in taking the bilateral relationship to the next level in terms of defense and strategic ties, co-operation in the field of space and counter-terrorism and unleash the potential of economic and trade ties, sources familiar with the preparations said. On September 29, Obama is likely to host Modi for a small working dinner, which is rarely accorded to a visiting foreign leader. The maiden meeting between the two leaders on September 29 would help Obama and Modi to know each other and prepare the ground for the next day’s meeting at the White House. Prime Minister Narendra Modi will deliver his speech in the United National General Assembly in New York in Hindi, Home Minister Rajnath Singh said on Sunday. Mukherjee was received at the Noi Bai International Airport by Vice-Minister for Foreign Affairs and chairman of President’s Office Dao Viet Trung along with other functionaries of the Vietnamese government and officials of the Indian Embassy here. The President was also given a guard of honour.